The goal of our project was to evaluate how improvements in road connectivity affect ecological resilience as determined by simulation modeling and global sensitivity and uncertainty analysis. We convened a team that spanned multiple types of boundaries, between disciplines, organizations, and countries. Here we feature crossing boundaries between (1) stakeholders and scientists, (2) data personnel and modelers, and (3) modelers and model evaluators. We discuss the challenges we faced and the practices we employed to effectively cross these three types of boundaries and thereby advance our project. 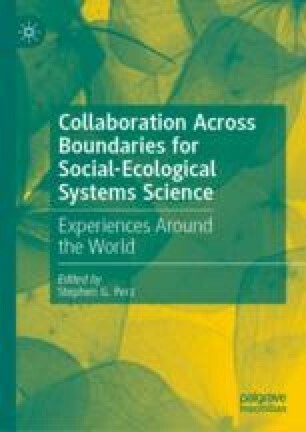 This chapter presents a suite of vignettes on the many challenges tied to specific boundaries we crossed, noting whether and how our strategic practices were effective. We conclude with reflections on our experience and lessons learned as they may support future collaborative projects that seek to span divides. Support for the work reported came from NSF HSD 0527511 and NSF CNH 1114924. We thank our many collaborators in our partner universities (UAP, UFAC, UNAMAD), the many participants in the original data collection, and the many stakeholders who participated in the workshops on modeling and the outreach workshops. All errors and misinterpretations are the responsibility of the authors. IIRSA (Iniciativa para la Integración del a Infraestructura Regional de America del Sur). 2008. Retrieved January 20, 2008 from www.iirsa.org.